Wrongful Death Lawsuit against Truck Driver and Company | Pritzker Hageman, P.A. If your loved one was killed in an accident caused by a commercial truck driver, contact our lawyers to find out if your family can sue for wrongful death and file a lawsuit against the at-fault truck driver and the trucking company that employed that driver. Accidents like this devastate families. Our attorneys will handle investigating and dealing with the insurance companies and trucking company lawyers and representatives, so you can be freed from those extra burdens. We will be working for you and only for you. We will collect nothing and you will owe us nothing unless we win. Our accident attorneys have helped many families like yours. Attorneys Fred Pritzker and Eric Hageman recently won $6 million for a family in a case where the vehicle that caused the accident experienced an equipment failure. Contact Fred and Eric to find out how they can help you and your family. You will not have to pay our law firm anything unless you win. We hold trucking companies and drivers accountable. We take every measure to get just compassionate for your loved one and your family and hold wrongdoers accountable, so these types of accidents can be reduced in the future. If you hire a truck accident lawyer at our law firm, Pritzker Hageman, P.A., to represent you, we will immediately do our own investigation of the accident to gather evidence needed to win your case. For many of our clients, the money is secondary. What they want is to know the truth and to hold all responsible parties accountable for the death of their loved one. Our law firm has the experience, skill and money to do that. 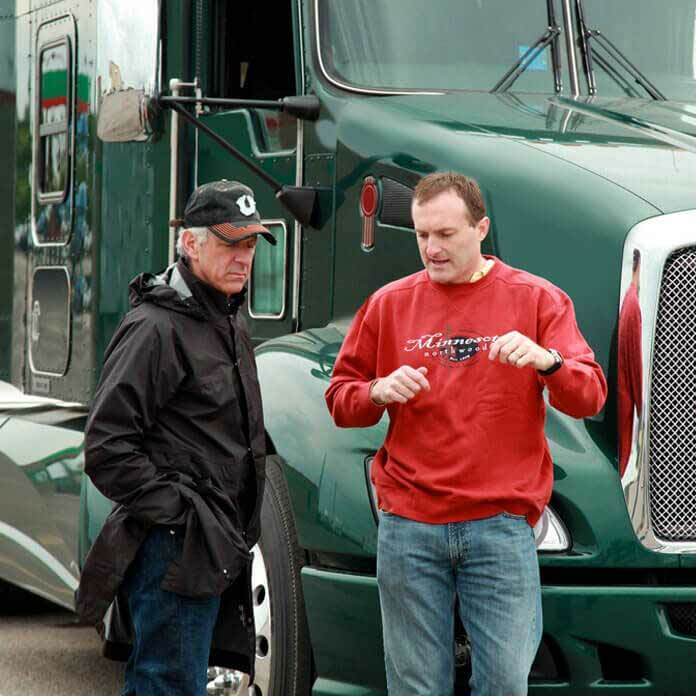 Attorneys Fred Pritzker and Eric Hageman inspect a semi-trailer after a crash. When your loved one is killed by a commercial vehicle, you have a wrongful death attorney can help you file lawsuits against all parties legally responsible for the accident. This can include the trucker, his or her employer, the owner of the cab and trailer, the owner of the freight, a maintenance company, a manufacturer of a defective vehicle part, a bar that served alcohol to a truck driver, and others. These claims involve specific laws that outline the procedures a family must go through to file the claims and recover on them. In most states, a trustee (or the equivalent) is appointed by the court. This trustee acts on behalf of the family. Our lawyers work with the trustee and family members to win the case. In most states, the laws allow the next of kin to recover on a wrongful death claim. “Next of kin” as defined in most states includes a spouse, parents, children, grandparents, siblings, nieces, nephews, aunts and uncles. A truck insurance company will be involved. If you have a question about a truck accident insurance claim involving Progressive Commercial or another insurance company, contact our lawyers for a free consultation. Send a spoliation letter. This is a letter to the trucking company requesting that the company preserve evidence related to the collision. Inspect the tractor and trailer. Every case involving someone killed by a semitrailer requires an inspection of the vehicle, including both the tractor and trailer. Inspect other vehicles involved in the accident. Our lawyers also inspect any other vehicle involved in the accident. For example, if your loved one was driving a car when he or she was hit and killed by a big rig, our lawyers would inspect the wrecked car, taking pictures and analyzing the wreckage. Again, we hire engineers and others who are accident reconstruction experts to help us. Obtain documents from the trucking firm. We make the trucking company and anyone else responsible for the wrongful death hand over all relevant documents. We pour over them looking for evidence of regulation violations, including driving too many hours, inadequate drug testing, etc. We also look at corporate relationships to determine what companies can be sued. Interview witnesses. Our lawyers do interviews of witnesses, trucking company employees and others in the presence of a court reporter. The resulting transcript can be used as evidence at trial. This interview process is called a deposition. Hire accident reconstruction specialists. We hire forensic engineers and other experts in the field of accident reconstruction. Below is an animation we created for a case. There is no amount of money that can ever undo the tragedy of a fatal accident. Nonetheless, in these cases, we are trying to achieve some measure of justice and hold someone or some entity accountable for what happened. What we often see in these cases is that the settlement or verdict we are able to obtain does some good in honoring the memory of the loved one who died. We recently saw this in a case involving a collision between a tractor-trailer and a snowmobile. We represented the family of a 16-year-old boy who was driving his snowmobile on a trail designated for that purpose when he crashed into the side of the trailer, which was illegally parked across the snowmobile trail. The young man was tragically killed due to the negligence of the tractor-trailer driver. After we achieved the settlement, the family set up a foundation that awarded scholarships in the name of their son who died. The scholarship fund awarded scholarships to high school age children who were pursuing a course of study their son would have pursued. In that way, the family was able to see that good came out of something that was so tragic. You can click here now to contact our lawyers for your free consultation. Our attorneys have been interviewed by The Associated Press, The New York Times, The Wall Street Journal, CNN, Lawyers USA and others. 21 year old Tulane University student, Margaret Maurer, was struck and killed March 5th, 2019 by a tire that had broken loose from a passing 18-wheeler semi truck. According to Gautier, Louisiana police, two tires broke loose from a passing semi truck and one of them struck Margaret as she and two friends were returning from a local rest stop to their parked car. A 2013 Freightliner 18-wheeler turned onto Old Pascagoula Road from Lockwood Drive. A motorcycle that was traveling east on Old Pascagoula Road ran into the 18-wheeler as it was turning. The driver of the motorcycle, Randal Glen Wade, of Irvington, Alabama, died at the scene of the accident, which happened on September 21, 2018. After death of Robert Bursik, from Amery, Wisconsin, on a Minnesota highway, our attorneys say longer truck trailers would result in more fatal rear end collisions. Truck crash accidents are at their highest level in more than a decade, yet trucking industry forces continue to press for regulations that would put longer, heavier tractor trailer rigs on U.S. highways. A fatal head-on collision in Winona County between two semi trucks killed both drivers. A Kenworth semi was traveling eastbound on I-90 as a Freightliner semi was traveling westbound. The Kenworth crossed the median and entered the westbound lane of traffic, where it collided head-on with the Freightliner, driven by a 37-year-old man from Roseville, Minnesota. A Chrysler 300 sideswiped an International semi which was backing into a driveway on a 2-lane road in Pine County Minnesota. After this crash, both drivers exited their vehicles and were struck by a Buick Roadmaster while standing on the side of the road.